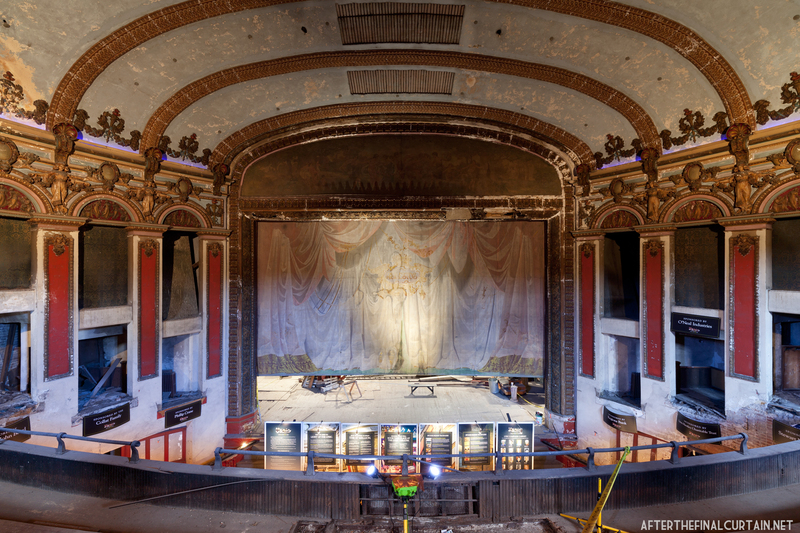 The Lyric is one of the 22 theaters in my new book “After the Final Curtain: The Fall of the American Movie Theater.” Find out more here. View of the auditorium from the mezzanine. 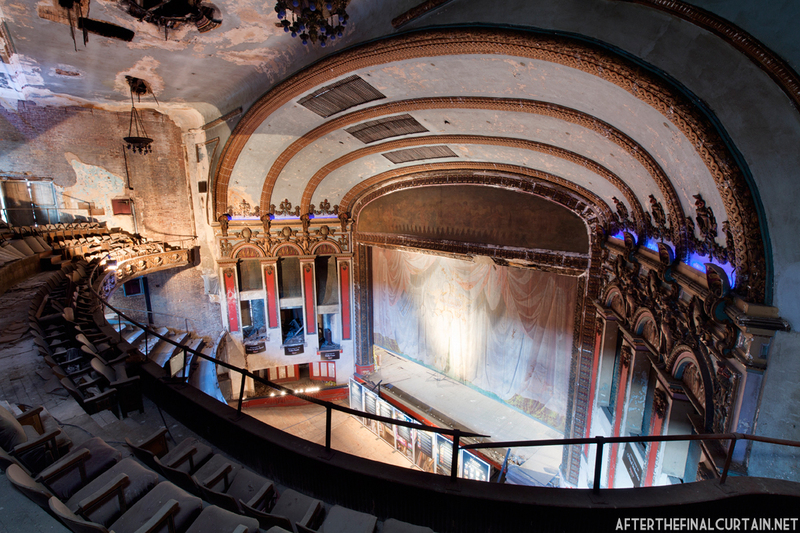 The Lyric Fine Arts Theatre opened on January 14, 1914 in Birmingham, Alabama. It was built for Louis V. Clark by C.K Howell, the architect of many theaters on the B.F. Keith vaudeville circuit in the South. Clark leased the theater to Jake Wells who owned and managed a number of theaters, including the nearby Bijou Theatre. The Lyric’s opening was delayed due to a legal dispute with the Orpheum Theatre over where shows on the B.F. Keith’s vaudeville circuit would play. 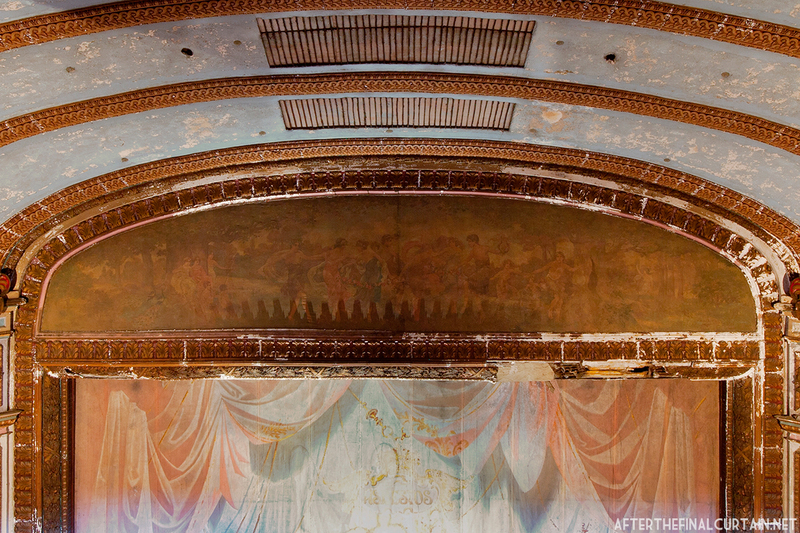 The mural above the proscenium is entitled, “The Allegory of the Muses,” and was painted by Harry Hawkins, a local artist. 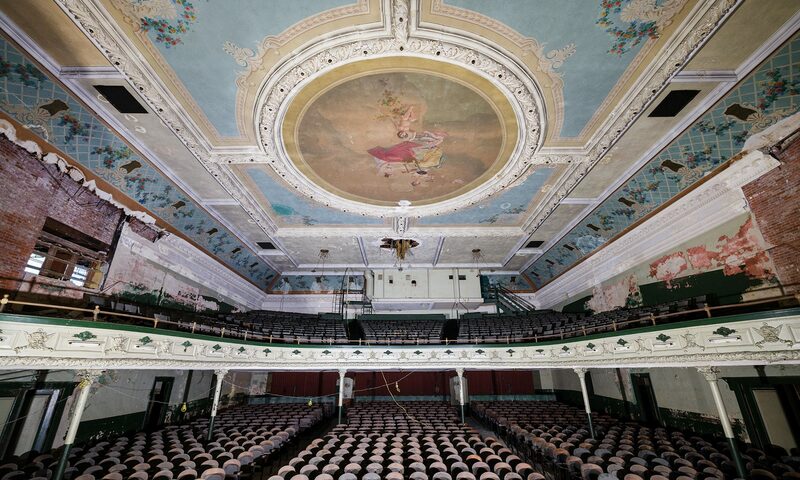 The 1,583 seat Lyric was designed as a vaudeville theater, with high walls and close seats for better acoustics during performances. 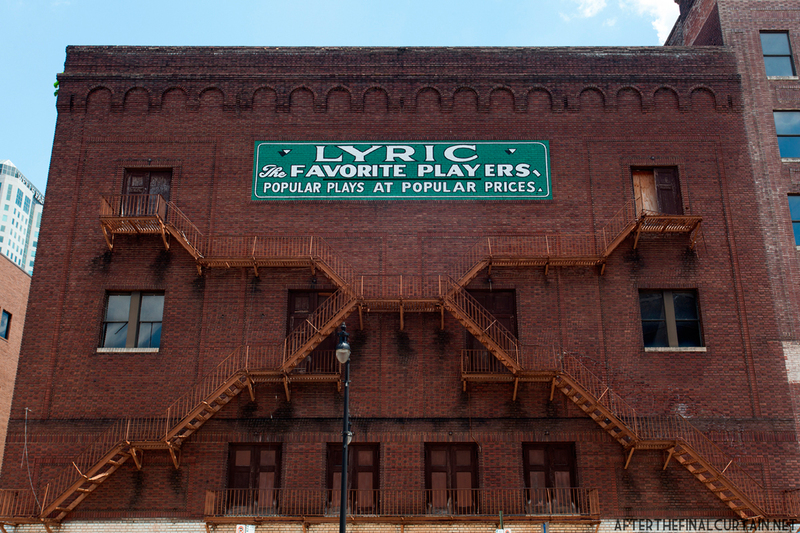 It was the last theater built in Birmingham exclusively for vaudeville performances. Over the years, a number of famous vaudeville acts performed at the Lyric including; Hardeen, the brother of Houdini, the Marx Brothers, Mae West, Sophie Tucker, Milton Berle, Rube Goldberg, Buster Keaton, Roy Rogers, Gene Autry and Will Rogers. In 1925, an organ was installed and silent movies began showing with the vaudeville performances. The Lyric was one of the first places in the South where people of all races could watch the same show at the same time, but the seating was still segregated. Wells lost his theater chain during the Great Depression, and the Lyric closed. It reopened on April 25, 1932 as a movie theater. The first film shown was “A Connecticut Yankee in King Arthur’s Court,” starring Will Rogers. Later that year, the theater was leased to Paramount and became a second run theater, showing movies that had originally played at other theaters in Birmingham. 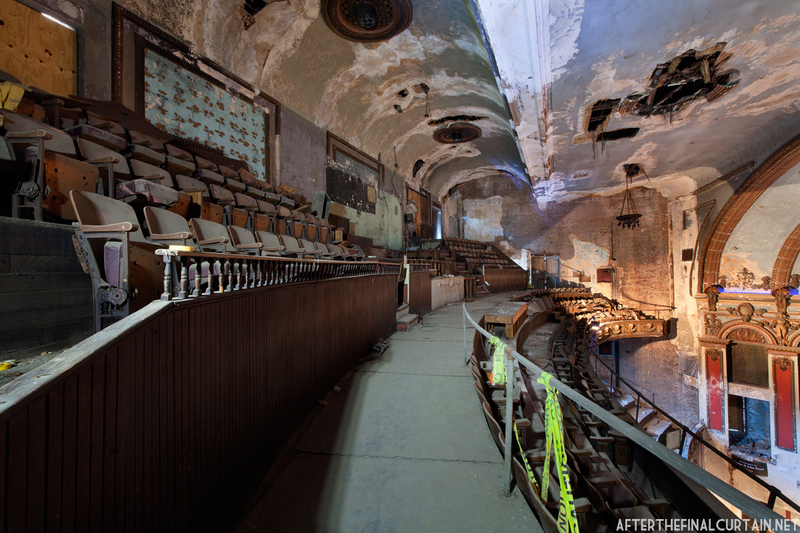 In 1945, it was purchased out of foreclosure by the Waters Theater Company, who continued to operate it as a second-run theater until it closed again in 1958. View of the side of the auditorium. 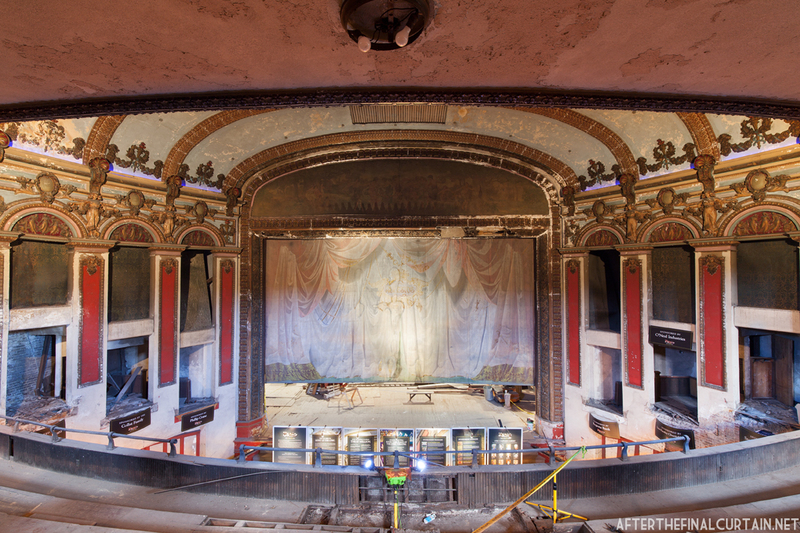 The theater remained closed during the 1960s, but in 1964 the Birmingham Committee of 100 looked into renovating the Lyric as a civic center – they were unable to raise the estimated $300,000 needed to restore the theater. Eight years later in 1972, Dee Sloan and Robert Whorton leased the theater, renovated the main level, and reopened the Lyric as the Grand Bijou Motion Picture Theatre on April 19,1973. 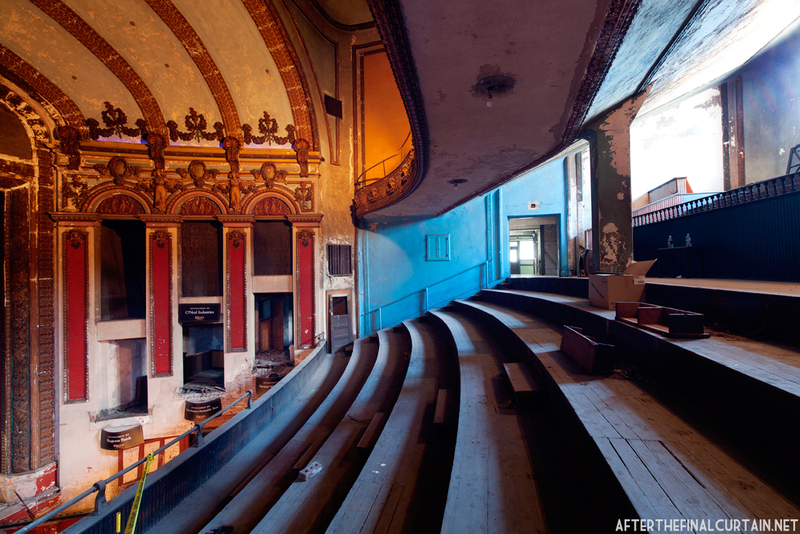 The theater was a revival house showing pre-1940s movies, beginning with “The Jazz Singer,” starring Al Jolson. It was not successful, and closed soon after. The Lyric reopened again for a short time as the Roxy Adult Cinema in the late 1970s, showing adult movies. Later, a beauty salon opened in the lobby and sealed off the auditorium. Bodybuilders posed on the fire escapes in the 1976 film Stay Hungry. 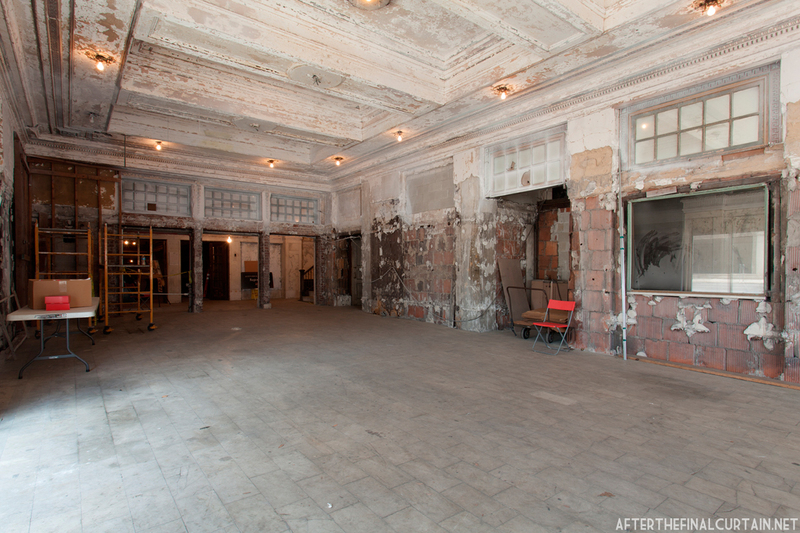 A beauty salon occupied the lobby during the 80’s and 90’s, sealing off the theater. View of the side of the auditorium from the mezzanine. 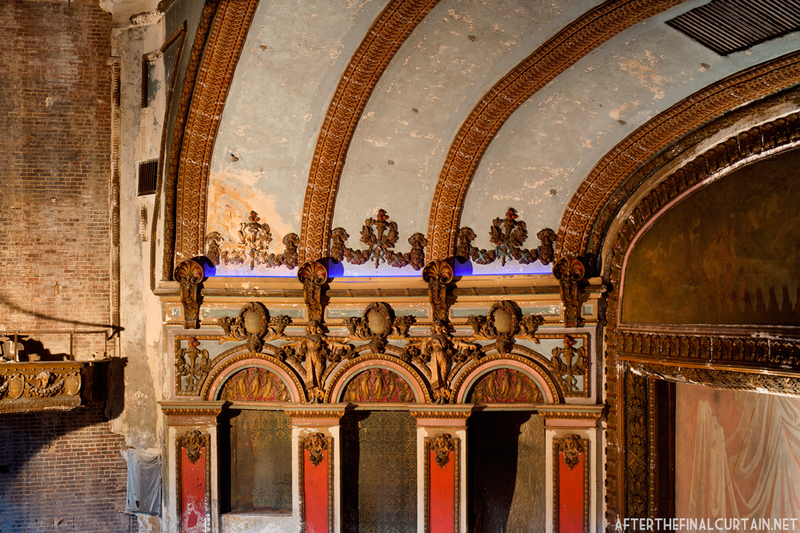 In the early 1920’s the theater was used for church services on Sunday evenings. 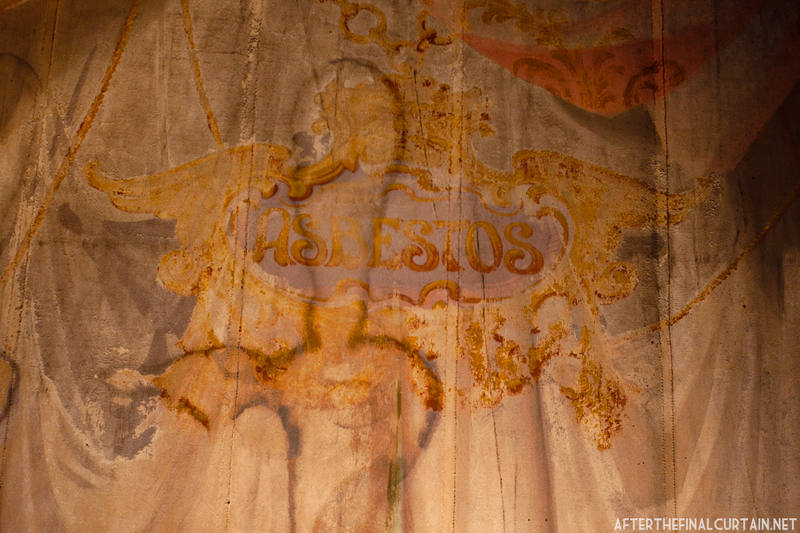 The original asbestos fire curtain still hangs in the auditorium. A close up of some plaster-work on the side of the auditorium. In the summer, air was fanned over two tons of ice a day to keep customers cool. 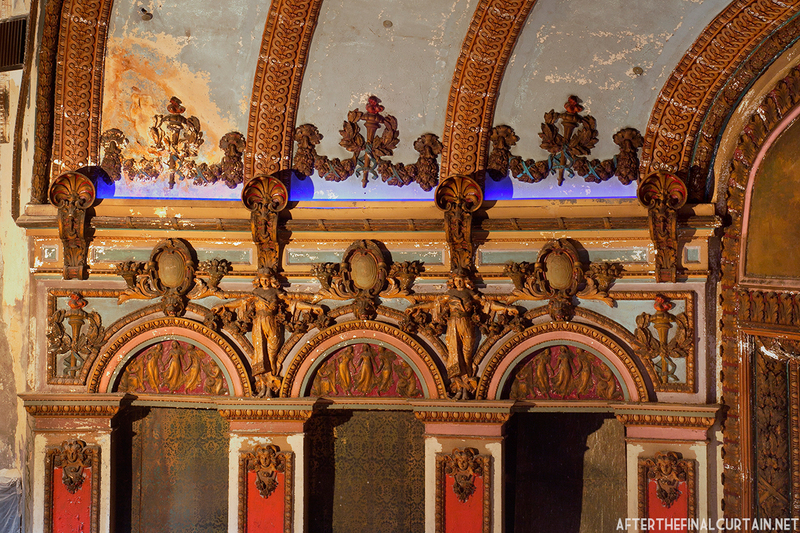 There is such stunning and beautiful detail in this theater that it makes me sad it’s not used anymore. 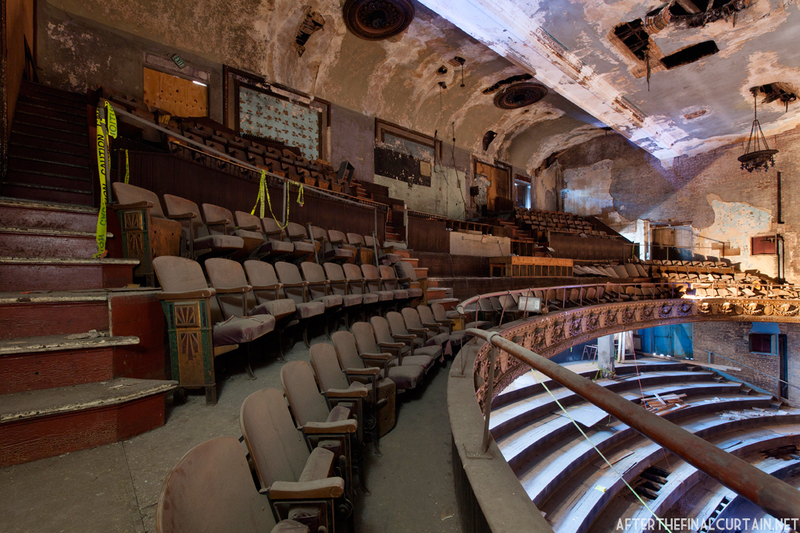 Imagine seeing a play or a concert in any of those seats. Just wow. Amazing photos. Thank you for sharing this beauty with us. You’ll be able to see performances at the Lyric very soon. Restoration is going to begin this month.